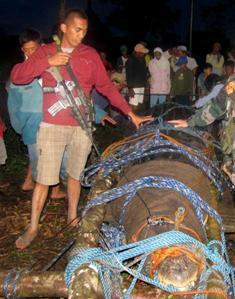 (AP): Relieved Filipino villagers threw a fiesta when they captured a one-ton crocodile, with about 100 people pulling the feared beast from a creek by rope then hoisting it by crane onto a truck. The party may have been premature. After the 20-foot (6.1-meter) saltwater crocodile was caught over the weekend, authorities said Tuesday an even bigger killer crocodile may lurk in creeks of the remote southern region. The crocodile — weighing 2,370 pounds (1,075 kilograms) and estimated to be at least 50 years old — is the biggest caught alive in the Philippines in recent years. Wildlife officials were trying to confirm whether it was the largest such catch in the world, said Theresa Mundita Lim of the government's Protected Areas and Wildlife Bureau. I saw two like this down towards West End a few days ago. Well…. almost like it. They were somewhat smaller……. O.K., they were a LOT smaller and had their tails curled over their back.